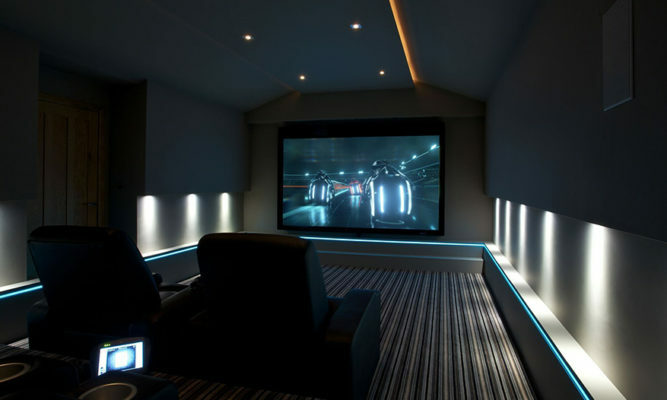 Having worked with a friend of our client on a previous high quality home cinema installation we were approached at the very beginning of this project and the scope of the room was clearly identified. 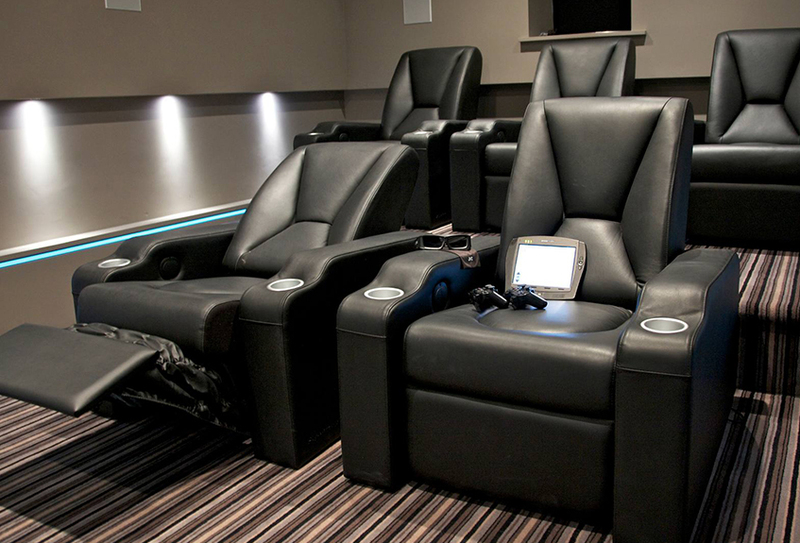 We needed to deliver a custom-designed room that felt different from the rest of the house, and would bring the family together to enjoy watching films and playing games, and it had to deliver PROPER 3D! After demonstrations of different levels of equipment, seating and lighting control options that we can incorporate in our designs at the Finite Solutions Show House our client decided on the audio visual equipment that delivered the performance he wanted and the style of seating and lighting design that appealed to him most. Armed with this information and the Architects CAD plans of the proposed room, a ground floor extension with lean too roof linking to the main property, we produced a series of 3D models of the design options. Knowing our clients requirements for details our models included all furnishings, seating, colours and lighting effects that would be produced in the room to give a real world feel for how the room would look. After reviewing these scale models with the clients they loved our ideas and were happy to progress with our very first design. Upon agreement of the look of the room and the equipment required, a detailed room build design of full working architectural drawings was produced allowing the clients own builders and electricians to completely construct, acoustically treat and decorate the room to our exacting specifications meaning we now had a room which not only looked beautiful but was acoustically isolated and designed for performance. Further soft suede wall panels were still being upholstered at the time of the photographs seen here which were the final touch to the rooms look and acoustic treatment. Upon completion of the room Finite Solutions engineers and programmers spent 10 days installing the 7.2 B&W CT range speaker system, JVC X9 projector, Niko lighting control and the Crestron TPMC-8 control system. The pre-built Mid Atlantic AV rack had been configured, tested and set up offsite at our rack-build facility meaning the whole system worked perfectly before ever being brought to site, which left only the ISF and Audessey commissioning and set up of the picture and audio system to achieve the optimum results from the room. 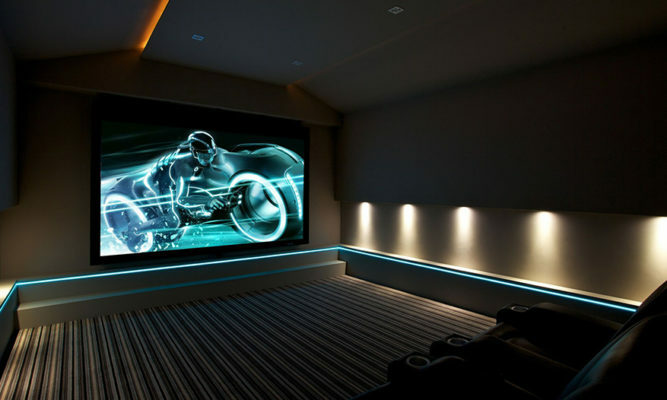 The performance of the surround sound and 3D picture is completely enveloping and makes you forget where you are as you are totally immersed in the action on the screen. As 70% of the use of the room is for 2D content we have separate presets for picture calibration which ensures the standard high definition images from Sky+HD and Blu-Ray are crystal clear and life-like without any over digitisation of the image processing. 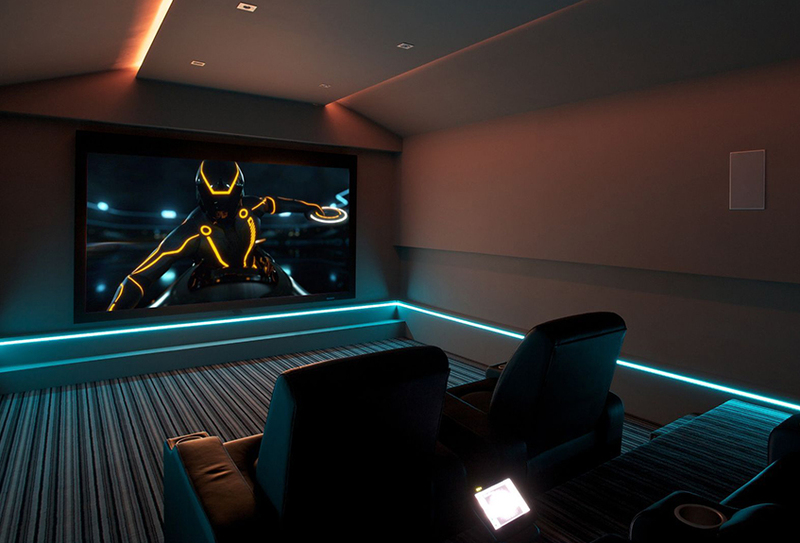 Our client loves his “Tron room”. Thanks to some last minute colour tweaks movie night is always high on the family agenda.